Nowadays, infographics are used by providers of search engine optimisation services to specifically generate or increase natural links to a target website. So with this in mind, professional SEOs should leverage infographics, making the most out of your infographic in terms of building and gaining the most links. Allow your readers to share your infographic easier by adding social media sharing buttons that are distinctly visible on the post and including a clear call to action at the end of your blog post to encourage them to share your infographic with their friends. Likewise, make sure also that reposting of your infographic and linking back to you would also be easy as possible. The best way to do this is to add a HTML embed code as this code will not only make it easy for people to re-publish your infographic, but it will also ensure that they link back to you (via an image link) and allow you to control the anchor text. You can also add your brand name to your infographic by adding your company logo and your site's URL at the footer of your infographic. This will ensure that people know where the content came from as there are some people where they will repost your infographic without crediting you as the original source and giving you a backlink. Encouraging your readers to share your inforgraphic with their friends is not enough, you also need to build links for it. One easy way is to submit it to some infographic directories such as Visual.ly, Cool Infographics, Infographics Showcase, and Amazing Infographics. Almost all of these sites will allow a credit link back to the original designer or publisher. Also, another great way to build links is by guest blogging. Since an infographic is an image, it doesn't count as duplicate content, so you can continue to post them even if it's been published on your site or blog. However, make sure that you write a unique content for your infographic. Then look for some authority sites that are in a relevant niche and start sending out some emails request. So for each site that accepts your request, make sure to write a brand new description or post to accompany the infographic. So as long as you're not making duplications of that copy, you can repeat this process multiple times, gaining more and more links each time you do so. To ensure that you can get the most out of your infographic in terms of inbound links and referred traffic, you can reformat your infographic for other channels. You can do this by animating your infographic. This will enable you to target video distribution platforms in addition to infographic submission sites. You can make use of Adobe After Effects (or a similar program) if you know how. 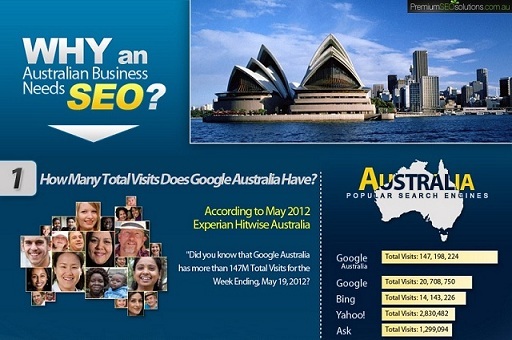 Or hire a Web Design Company in Australia to do this on your behalf. Make sure to supply them with the working file, which will most likely be in Illustrator or Photoshop format). Another way to reformat, particularly if you have a long infographic with lots of different stats, is by chopping it up into slides and turning it into a slideshow, using either PowerPoint or PDF format, which can then be uploaded to platforms such as SlideShare or Scribd. Also promote your infographic via social media and bookmarking platforms. You can promote the infographic via your own and your company's Twitter, Facebook, Digg, Reddit, and StumbledUpon accounts, particularly if you have fairly strong profiles on those platforms. Also, remember to include relevant hashtags with your Tweets. This can help to widen your reach beyond your normal friends and followers, giving you a better chance of retweet and referred traffic. Keep on visiting our SEO Tips and Updates Blog. Feel free to read our SEO and Social Media articles and news. Or if you're searching for Dedicated SEO Experts that can help you in your SEO and Social Media campaigns, then see our SEO Portfolio.